Courchevel is part of the huge Three Valleys ski area, which has 600 km of pistes. Many of the slopes in this resort are faced north so the snow is some of the best in the whole area with pistes for everyone, from beginner to expert. The interesting thing about Courchevel is that, in fact, it’s not one resort village, but four separate ones, connected by lifts and pistes, as well as, a road. The four resorts are named Le Praz (1300), Courchevel Village (1550), Moriond (1550) and Courchevel (1850). Le Praz is a real French Alps village and the wooden chalets give it a rustic appeal. Here you will find the ski jumping hill which was built for the Olympics in 1992. The Courchevel Village is a quiet and peaceful area, perfect for family holidays. Moriond has an attractive village centre with good restaurants and bars. For non-skiers, there is a large watersports centre. Located at the top, Courchevel is the biggest resort village which shines with glamour and luxury. The resort is full of exclusive facilities and services, from five-star hotels to Michelin starred restaurants. Luxury comes at a price, so Courchevel (1850) requires a bigger budget. There are four airports which serve this French ski resort: Chambery, Grenoble, Lyon and Geneva airport. Chambery airport is closest to the resort and the travel time is 1h 30 m. Grenoble airport is used only in winter and it will take 2h 10 m to get to Courchevel. However, Lyon and Geneva airport have the best connections to the UK and other European countries, so these airports are widely used throughout the whole year. Using public transport to get from the airport to Courchevel is the cheapest option, but also the longest and not so convenient, as you will need to change buses. There are regular bus lines from the airport to Moutiers where you need to change to other bus or take a taxi to Courchevel. Moutiers is only 35 minutes from Courchevel. If you’re arriving by train, the nearest train station is Moutiers Salins Brides Les Bains. Many international and national trains arrive at this station from where you will need additional transport to your accommodation. The most convenient Courchevel transfer option is by booking a private ski transfer. You can arrange private airport transfer from Geneva airport to Courchevel and have a pleasant journey with a professional driver. Another advantage is that you don’t need to worry about your luggage and ski equipment, as there are no limitations, and you will need to choose a vehicle which can fit all of this. Usually, this is an all-inclusive service with fixed price. The cost is charged by vehicle, so the cost per passenger is significantly lower. The Geneva airport transfer service can be booked online prior the arrival. Once you arrive at the airport, the taxi driver will be waiting at the meeting point with a sign showing your name. The travel time from Geneva airport to Courchevel is 2h 30m. Courchevel offers 150 km of pistes which are more than enough for a week’s holiday. The lift system is efficient with lots of fast gondolas and chairs. For beginners, there are nursery slopes in every of the four resort villages. However, Moriond and Courchevel are recommended for their green runs where beginners can continue after they’ve mastered the basic skills. Courchevel is a paradise for intermediate skiers. 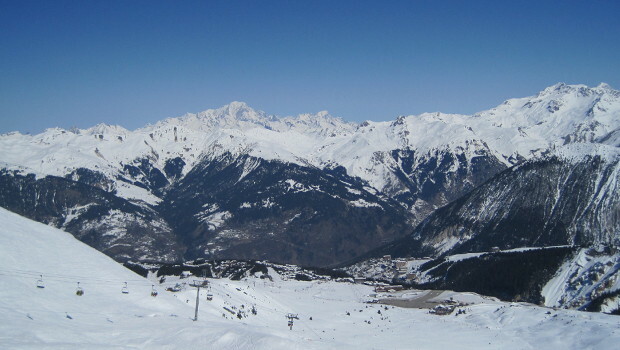 With around 75% of blue and red runs, this is the best ski area in the Three Valleys. The pistes are groomed almost every night so this ski area is according to the highest standards. There is more visibility on pistes lined up with trees, so you can head to the long blue run Folyeres or the red run Brigues. For advanced skiers, there are great black runs and off-piste skiing opportunities. The Grand Couloir is a great black run which you can reach by riding up the Sailure cable car. Just a short hike from this piste you will find great off-piste skiing in the Croix de Verdons Couloir or the Petit Couloir. Col du Fruit and Valee des Avals are well-known to expert skiers and will take you away from the pistes. Lively apres ski is not what Courchevel is recognised for, but it still holds its own. There are only a few restaurants near the pistes, so everyone goes to the bars on the resort streets. The best wild afternoon parties are at Folie Douce, down at Meribel at the mid-station of the Sailure Express gondola. If you decide to stay local, head to the Verdons which is located at the top of the Verdons gondola, where you can find live music and some dancing. Le Tremplin is at the bottom of the Courchevel (1850) pistes, so you can stop for a drink after a long day of skiing. At night, there are many lounge bars with live music where you can have fun. Head to Tremplin for karaoke, while the Funky Fox features live music or DJs and dancing till 4 am. If you’re up for late night parties, then you should visit the Les Caves nightclub, as well.